The seminar is free. Refreshments are included. 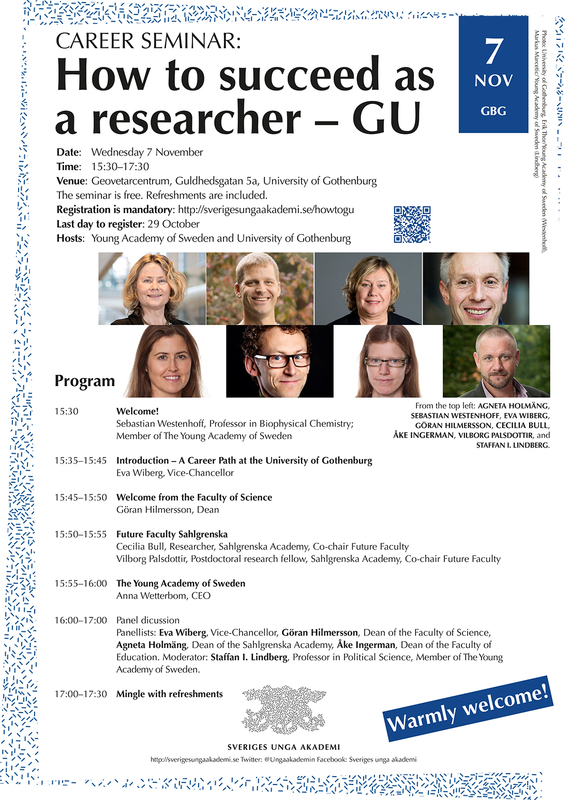 The Young Academy of Sweden and University of Gothenburg (GU) have the pleasure to arrange an event about career systems and how to succeed as a researcher at GU. We welcome PhD-students, postdocs and researchers. Previous stops on the Academy's career seminar tour have been arranged at Uppsala University , SLU , KTH , Lund University, and Linköping University. – How do career paths look like in the different disciplines? – What criteria are used for promotion in the different disciplines? – What will happen in terms of career paths and tenure track positions in the near future? – Current and future challenges for young researchers? Det är inte tillåtet att göra anmälningar längre. Sista anmälningsdag var den 6 november klockan 17.00.